The warm and sunny days are upon us, which means Bike Camp is right around the corner. Our Cruisers and Urban Riders Bike Camps for kids ages 11 and older are a unique and fun way to build skills and knowledge while exploring the city. Beyond biking, we have amazing partners who provide campers with insight into the Portland bike community. Campers will have the opportunity to meet with local bike builders, racers, and bike-based businesses. 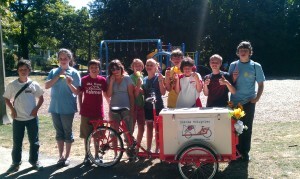 One of our campers’ favorite field trips is meeting with Ryan Hashagen of Icicle Tricycles. Icicle Tricycles became a community partner last year and we are excited to be working with Ryan again this summer. Icicle Tricycles delivers healthy, delicious, and locally-made paletas. In order to receive their treats, campers must participate in a bike quiz. Ryan asks each camper to name a different bike part and share their favorite Bike Camp adventure. “It was a weekly Icicle Tricycle highlight to deliver our all-natural treats to the Community Cycling Center Bike Campers. I really enjoyed engaging their passion for cycling (& popsicles! ),” notes Ryan. We are looking forward to a summer of fun adventures! Check out our Bike Camp schedule to see which Bike Camps work best for your kid. Thank you to Ryan Hashagen, his delicious treats, and all of our other community partners.